Google has made its own version of the Amazon Echo Show. 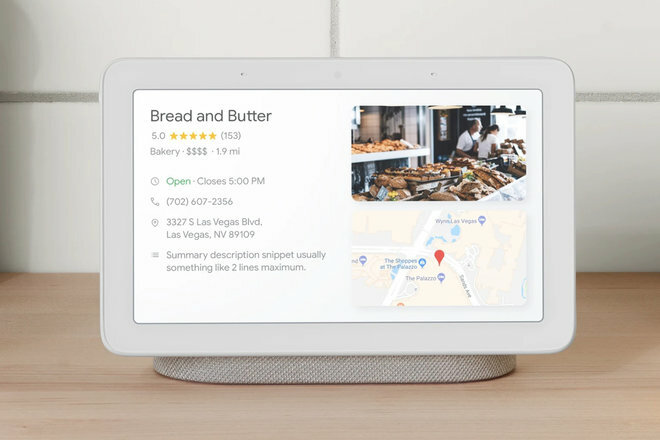 Called Google Home Hub, it’s a smart display with built-in Google Assistant. Now, this device is unique compared to other displays, because it doesn’t come with any cameras. You can still do video calls, but they’d be one-way video calls. 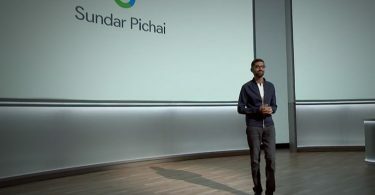 You see, Google wants this to be a product you place on your nightstand – or some place like that – and still feed comfortable. What is Google Home Hub? 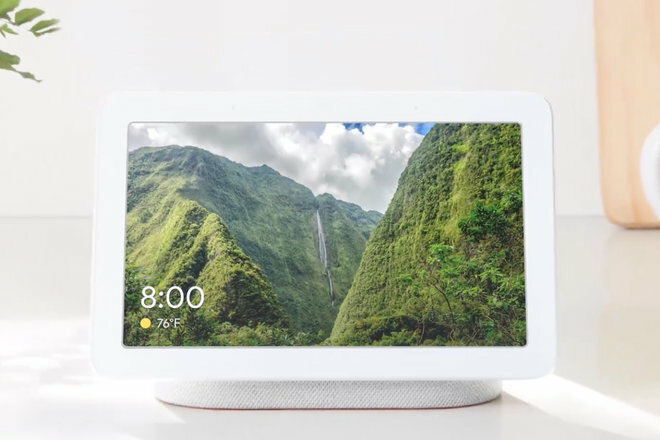 Google Home Hub is a Google Home-branded speaker with a 7-inch LCD display that floats on a speaker base. 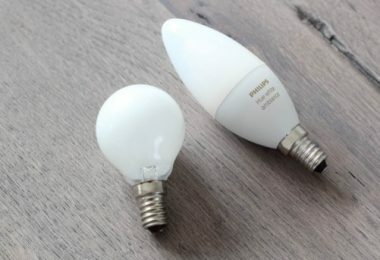 On the top of the device, there is an Ambient EQ light sensor that allows the screen to automatically adjust to match the lighting in the room. 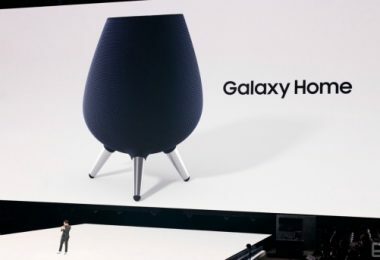 It also has soft rounded corners, and is designed to sit on a range of surfaces, such as the kitchen counter or nightstand, according to Google. 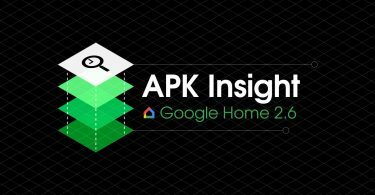 It lets you not only hear Google Assistant and your app integrations but also see them and the information you’re seeking. Home Hub is the newest member of the Google Home family, joining Home, Home Mini, and Home Max. Like those, it features Google Assistant. And it provides access to Google products like Search, YouTube, Photos, Calendar, Maps, and more – all viewable from the display. We’ve seen similar Google Assistant devices from Lenovo and JBL, but Google is trying to offer up something slightly more streamline with the Home Hub. Per usual, you can use your voice to control your smart home, add something to your calendar, search the web, and listen to music. Anything you can do with a Google Assistant device, you can do with the Google Home Hub, though it’s meant to be visual. Google uses the screen to show you more information about the weather, about local restaurants, and so on. 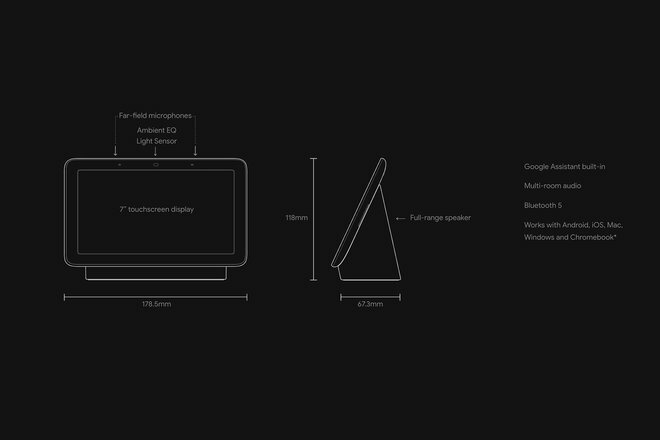 Google Home Hub measures 67mm (D) x 178.5mm (W) x 118mm (H) and weighs 480g. It comes with a 1.5m-long 15W power cable, 7-inch LCD screen, full-range speaker, two-mic array, a light sensor, support for Wi-Fi and Bluetooth, and a DC power jack port. How does Google Home Hub work? 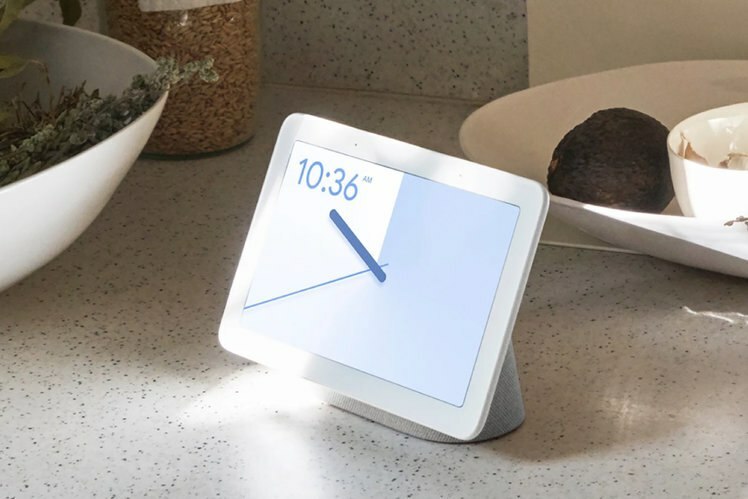 Whenever you say “Hey Google, good morning” to Google Home Hub, it will immediately serve up a personalised, visual overview of your family’s activities from Google Calendar, your commute from Google Maps, your latest reminders, the weather forecast, etc., according to Google. Plus, the device supports Google’s Voice Match, so up to six people in your home can get their own personalised Mourning Routine. Google Home Hub lets you browse millions of recipes and start cooking, all hands-free. You can go through the ingredients and recipe steps, one by one, and Google Home Hub will save your place if you want to stop and multitask while doing food prep. Google Home Hub doubles as a photo frame. It can pull up photos and features your best shots with a new feature called Live albums. Google Photos automatically adds new photos, avoiding duplicates and blurry shots, and you can share your live album, so when that person sets up their Home Hub, they’ll see your album. Plus, you can just say to Home Hub, “Hey Google, show my pictures from LA,” and voila! 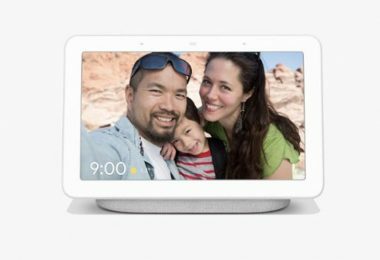 Google decided to not include a camera on Google Home Hub, so you feel comfortable placing it your home, like the bedroom. However, it did include Ambient EQ light sensor, which allows the screen to automatically adjust to match the lighting in the room. 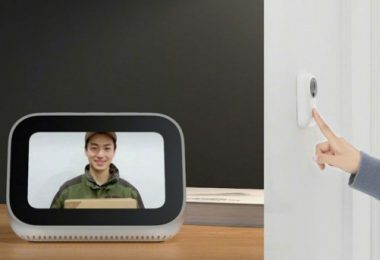 Photos displayed on the Google Home Hub should blend in the room – thanks to no glowing screen. And, when it’s time for bed, it’ll dim the screen. One of our favourite features is the easily accessible smart home controls menu. Just swipe down from the top, and you can access all your rooms and devices. 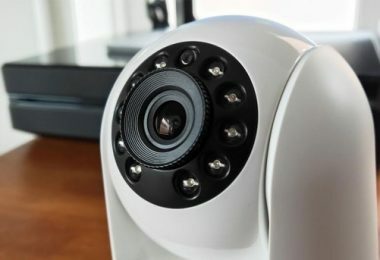 There is also an option available to broadcast a message or check your cameras (like through Nest Hello) or turn up the volume on the TV, and so on. You can control over 10,000 types of smart home devices from over 1,000 popular brands. Lastly, you can use Google Home Hub to watch YouTube videos – something you can’t do on Amazon’s Echo devices. 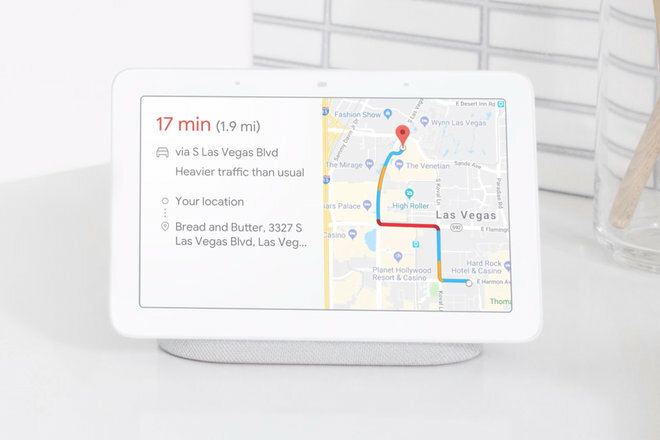 How much is Google Home Hub? It costs $149 in the US (£13 in the UK) from Google Store. You can get it in Chalk, Charcoal, Aqua, or Sand colours. Also, when you buy Google Home Hub, you’ll get six months of YouTube Premium on us, so you can enjoy YouTube Music as well as all of YouTube ad-free. When will Google Home Hub be available? Pre-orders are open now. It’ll be in stores from 22 October in the US, UK, and Australia.